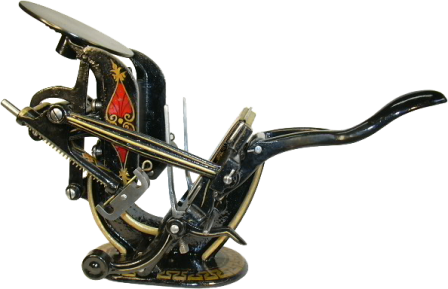 The Caxtonette is a two-roller, self-inking lever press, similar in profile to its sister, the larger Caxton. Both were made by Curtis and Mitchell of Boston, and each features a distinctive weight-, rather than spring-operated, gripper mechanism. In this case, it is the Caxtonette that is the more elegant of the two, with ornate detailing (see photo) on its backside. Edward Curtis and Edward Mitchell were Boston printers, onetime type-founders, and suppliers of printers’ goods. From 1875 they introduced a range of presses, mostly aimed at the amateur market, and continued production through the 1880s.